Darjeeling: Gorkha Janmukti Morcha president Binay Tamang has claimed that senior party leaders on the run with rival Bimal Gurung want to join Trinamul. Tamang said he "had been told" that some of Gurung's loyalists were in contact with Trinamul leaders and that they had expressed their desire to join the party. "This is a development of the last nine to ten days," Tamang, who replaced Gurung as the Morcha chief, said on Sunday. No senior Trinamul leader wanted to comment on the claims as political affairs related to the hills are handled by chief minister Mamata Banerjee or minister Aroop Biswas. Biswas could not be contacted despite repeated attempts. Tamang claimed that a leader, who was earlier based in Delhi and later shifted to Darjeeling, was trying to "liase" for the Gurung camp leaders. "I have been told that this person is establishing contact with the TMC leadership. 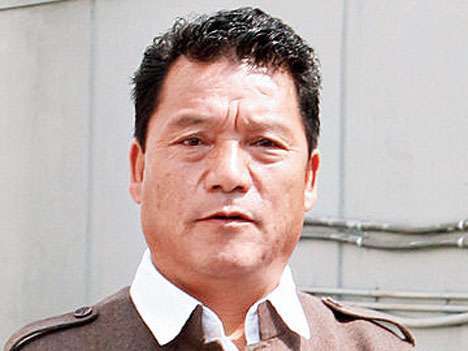 He is basically trying to seek an escape route as we have found out that a sum of Rs 1.25 crore meant for cinchona plantations was deposited in the bank account of his wife," said Tamang. The Morcha chief highlighted this to drive home the point that he had safeguarded the party since taking over as its chief late last year. "Had I not taken the step then (of revolting against Gurung), this party (Morcha) flag would have vanished from the hills by now. Look at those leaders who were calling me a betrayer, they now want to join the TMC," Tamang, also the chief of the Gorkhaland Territorial Administration (GTA), said. Tamang spoke at length on why he had objected to Gurung's decision to turn the statehood agitation violent last year. "When I told Bimal Gurung not to indulge in violence, he told me to come and meet him wearing saris and bangles. I had told him that violence will lead us nowhere." According to Tamang, he had asked Gurung to shun violence after nearly 300kg of gelatine sticks were stolen from a power plant from near Bijanbari during the last phase of the agitation. "Even if you read history, there is much planning when an armed struggled is launched. Here, we had someone suddenly deciding to indulge in such activities, even though the people had supported our party for our non-violent philosophy," said Tamang. Gurung faces a slew of cases related to the violence during the statehood agitation that began in June last year when the chief minister was in Darjeeling holding a cabinet meeting. He briefly surfaced in January this year in Delhi. Tamang said he feared for the lives of the youths who were with Gurung at present. "I am getting information that these youths are given Rs 2,000 (in Nepalese currency) per week. They are leading a miserable life and being asked not to return home over fears that they would spill the beans about their whereabouts," said Tamang. "Just a handful of youths are with him (Gurung) now and I am hearing that many of them have stopped contacting their family members," Tamang added. Gorkha Janmukti Morcha president Binay Tamang has claimed that senior party leaders on the run with rival Bimal Gurung want to join Trinamul.